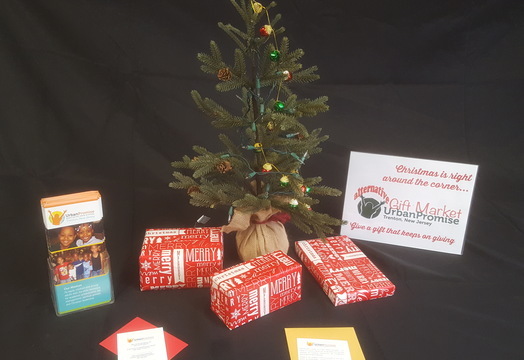 Alternative Gift Market 2018 - UrbanPromise Trenton | CommitChange | We help organizations raise more money, more sustainably. Give the gift that gives so much! Christmas and Chanukah are right around the corner...hard to believe but it is true! Are you thinking about your gift giving? Not interested in Black Friday? Do you have a friend who has everything? Do you exchange gifts at the office but you can't seem to find anything? Are there people in your life who mentored you and changed your life in such a way that you wish there was a way to honor their spirit of service? UrbanPromise Trenton can help! You can find a gift for your friend who has everything, come in on budget for your co-workers and honor a special person in your life by shopping at our Alternative Gift Market! You help kids and teens in Trenton NJ with this donation and you wrap up your gift giving! It's win-win for everyone involved! Look at our gift options and choose one or more for purchase. If you make your purchase before December 15, our elves will get busy creating a special gift card for you to give which will indicate what donation you made in honor of your friend. If you order after December 15 (up until noon on Christmas Eve) we will email certificate(s) for you to print and give to those for whom you purchased gifts. It's like Amazon but it is a gift that keeps on giving! Now that's shopping done the right way! Family and friends are at the heart of the holidays and we are grateful that you are part of our family! PS: Your gift is tax-deductible as allowed by the IRS.